No, you cannot switch the sounds on these sound boards. The boards are also different from the Master replicas versions. I tried to convert mine as well but in the end I have no more sound. The LED works fine but the sound is just gone. Any ideas? 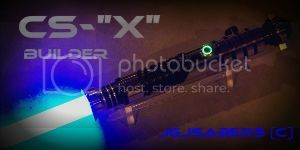 This tutorial will show you how to use the store's conversion kit for your removable blade version of the Hasbro Signature Series FX lightsaber using the kit available in the store. It will convert the saber to a single, in-the-hilt-led syle which will allow for a brighter blade than stock. The scrolling blade extension/retraction effect will be lost if you do this, so keep that in mind. TCSS Conversion kit for this saber - BE CERTAIN YOU BUY THE CORRECT KIT!!! THE MR KIT WILL NOT FIT THIS HILT!!! *type of lens and holder will depend upon your led selection. Make sure you get the correct lens and holder for your led choice. Lift off the base ring and set aside. Do not lose the screws! These will be reused later. WARNING: This is a "safety" type screw, meaning there is a "post" in the center of the hex key hole to prevent removal. If you do not have a safety type Allen wrench, a standard type can be used to remove the screw, but it will be difficult, and you may damage the screw. IF you happen to damage this screw, don't worry, the replacement blade socket in the kit accepts 10-32 screws, so a 10-32 button head cap screw will work just fine instead. You should then be able to get it free far enough to pry in the center, and remove it. The seam along the side of the housing should split. Do both sides, then lift off the top. The wires are as follows: Brown, Red, Orange, Yellow, Green and Blue are the positive leas for the main led. These can be bundled together and will go to the main blade led's positive pad, or simply removed from the board altogether and replaced with a single wire. This tutorial will cover removing them entirely. The violet and gray wires are the blade cut-off switch. These will need to be connected to each other later, and do not need to be removed, but it may be easier to do so if you choose to follow that route. The white wire is the negative for the clash sensor. If you did not order a replacement sensor, de-solder and remove the stock one from the blade connection housing on the blade. There are two screws securing the sound board to the housing, remove those to allow you to remove the sound board. This will make it easier to re-wire the board. Remove the board from the housing, de-solder and remove the wires from the board. Clean the pads off using a de-solder wick, or copper braid. Solder it in place by soldering to the underside of the pads, but wait to solder the thin wire until you complete the next step. Attach the led to the copper heatsink using the thermal adhesive pad. A piece of clear packing tape works great for securing the top of the housing. Then re-install the control box and the gold plate. hot glue works for re-attaching the gold plate. Tape it off to protect the finish. Be careful not to remove too much....you can always take off more material, but you can't put any back on! Is this the same process as the 05 ROTS Anakin? The images don't show so you can't follow! When I posted that link to the other tutorial, the pictures were still visible...not my fault photo bucket changed their plans and no longer allow third party hosting for free accounts. The Anakin is one of the easiest to convert. This video shows some details. The music is annoying. All of the soundboards are the same with wiring.